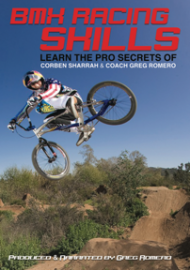 Learn the skills of Corben Sharrah and the BMX Skills Development Method of Coach Greg Romero. The new school has arrived in the sport of BMX racing, and the skills have gone to a whole new level. The talented and fast Corbin Sharrah is riding on that level, winning his first Supercross race last season. At 20 years old, the 2011 Pro National Champion is here to show you how the new school rides. His coach, Greg Romero, a former professional of ten years, winning over a hundred pro BMX races, shares his methods of BMX racing skills that made him, Sharrah, and past Olympic medalists some of the best in the sport!